Hello, I’m Chrissy and today, for The Writing Desk, I’m reviewing a brand new Diamine Shimmer ink for 2018: Diamine Dragon Blood Shimmer ink. Diamine Dragon Blood Shimmer ink is one of the latest 8 new inks to the Diamine Shimmer inks range for 2018. It is a reasonably saturated, blood red ink with gold shimmer. It’s a slightly browner leaning red than several other reds I compared it against and it easily shows up it’s gold shimmer. 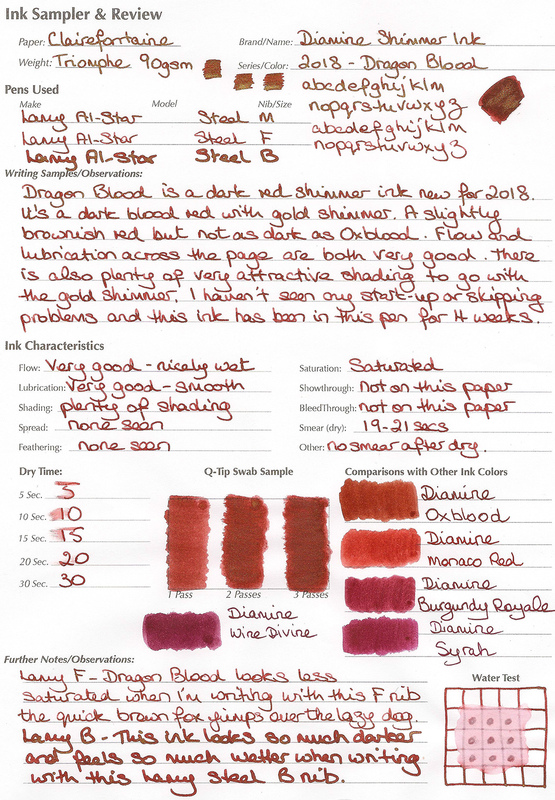 Dragon Blood is not as dark as Oxblood, but is darker than many of the other popular Diamine red inks. Exactly what you might imagine for Dragon Blood, neither too brown nor too pink. I saw some very nice shading as well as plenty of gold shimmer and found Dragon Blood a nicely wet ink to write with. It flowed much wetter, and looked darker in the Lamy Safari pen with B nib that I used. While I was writing with the Lamy Al-Star with M nib it dried within 15-20 seconds on Clairefontaine Triomphe paper and once dry it didn’t smudge or smear. It didn’t suffer from any hard starts or non-starts when I put the uncapped pen down to do swab tests, dry times and water resistance. In fact it never suffered from hard starts despite this ink fill having been in this Lamy Al-Star pen for over a month. I’ve deliberately left it for days in order to see if it suffers from hard starting or any skipping when I uncap the pen and start writing again. It has never failed to start writing immediately. It easily washes off of my hands with cold or warm water and bar soap and it easily flushes out of my converters and pens just using water. I’m finding that Diamine Shimmer inks seem wetter than they used to be and that makes them easier to use in many fountain pen brands. Available in decorative 50ml glass bottles exclusive to the Diamine Shimmer ink range.